A very happy Wednesday to you, friends! How are you on this lovely day of September? that were handmade by my dear friend Sarah. and vintage delights like tea cups and beautiful china. so I asked if she would be interested in sewing one. . .or three for me. She graciously said yes - what a dear! and sent everything her way. This sweet floral print is perfect for summer. And the third skirt has lovely little dandelion puffs all over it. I must confess that I am in love with this one. and she would welcome an order from you. She also has a Facebook page which you can find HERE. Sarah has kindly offered my friends and readers a discount. Sarah also offers free shipping for USA residents. since we live only a few hours away from one another. and her blog is filled with wonderful tips and creations. I encourage you to stop by for a little visit. Get ahead on your Christmas shopping, sweet friends! 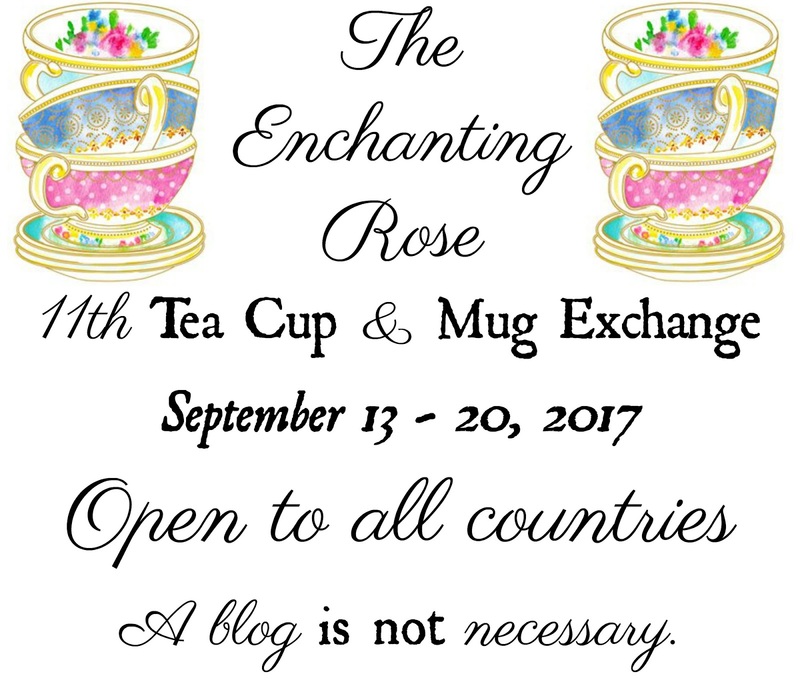 registration for the 11th Tea Cup and Mug Exchange will officially begin. You can click HERE to read about this lovely event. Hugs and love to you, friends! Your new skirts are beautiful! I love the pictures of you beside the fence with the sunlight. Sarah did a lovely job! Your skirts are absolutely lovely! Thanks for sharing with us. How fun to have some new skirts for the season ahead. Your friend did a great job! It's always great to find some new bloggers so I'll look up Crazy Creations. Have a wonderful day, Stephanie! Hi Stephanie, The skirts are beautiful and Sarah did an amazing job. You look beautiful in each one. Hard to pick a favorite as they all are beautiful and I love the fabrics. Love Sarah's shop. Thanks for sharing. What talent! I love those skirts -- I'm a 'skirt' girl myself no matter what the season. Chaz has lovely things as well. Thanks for introducing us to these ladies and their talents! Wow, your skirts are so lovely and you look beautiful in each of them! Your friend Sarah is very talented. And your choice of fabric is perfect! the skirts are great and i really like the fabrics you picked. we are like minded in that when i find something i really like, i buy it in 3's or 4's and i don't even worry if the fabric's are the same. i have 4 pair of khaki capri pants that feel like they were home sewn for me. when i bought the first pair and discovered my love for them, i went back and got 3 more. the skirts are undoubtedly comfortable and they look great on you!! you are photographed beautifully in your pictures, i will stop by and visit chas!! i love my new knitting bag, i love, love, love it. it is so beautifully sewn and it is perfect for what i needed. thanks so much stephanie!!! 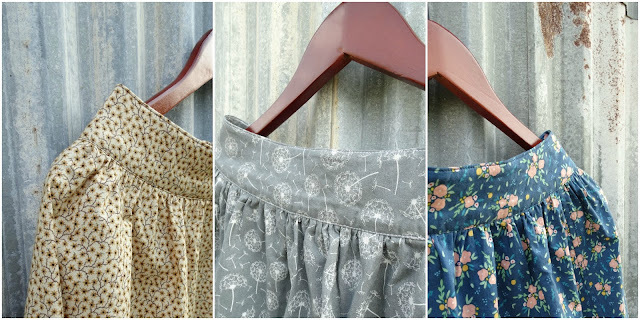 Not only have you three beautifully made skirts (which I adore!) but you have a precious friendship to treasure! The skirts are beautiful and I love the pictures of you in such tranquil scenery. I'm off now to visit Chas. Oh, so pretty Stephanie! I had to go back and look at the dress she made for you. She really does lovely work. And the setting for your pictures is beautiful! I notice that your hair is quite a bit longer than when I saw you, which I know makes you happy! You look lovely either way, but if I could wear longer hair, I'd definitely go for it. Sarah is such a talented seamstress! Your skirts look perfect on you. Who took the photos? Your pretty photos look like they could be a cover on a book! You have some very talented friends, Stephenie! Thanks for sharing their links. My compliments also to the photographer, too! Stephanie, you are beautiful inside and out! LOVE the skirts. I will definitely save Sarah's Etsy shop! Your new skirts are so cute and so YOU! You model them very well. I too love the dandelion one the most. How fun to have your own personal seamstress. I remember the dress from last year and love it too. I love your new skirts and you are right about the dandelion one - so cute! Your skirts in such a gorgeous setting are so beautiful! Wishing you all a wonderful mug exchange! Oh so pretty, smiles. Thank you for sharing. So pretty! The fabric you chose is lovely. And your pattern is so classic. You look beautiful! Hello Stephanie, wow you have such talented friends. I love the skirt your friend sewed up for you and you look so pretty in them. I hope you enjoy wearing them for summer and fall. Enjoy your day. Your skirts are so beautiful and fits you very well. What beautiful talent! Sarah's work is just beautiful- I remember admiring her last creation for you that you shared. And oh how lovely you look, dear friend! Just beautiful, elegant, and so classy as always. What a joy to find such perfectly sweet sewing inspiration, also! I so enjoyed the photos and loveliness of your post, as every post. Hugs and blessings to you, dear Stephanie! Such pretties to see at both sites - thank you. Can't wait to sign up for the swap because I had SO much fun last time. I especially love that last skirt, you make them all look lovely though. Wonderful of you do such a feature for you friend. Sarah did a beautiful job on those lovely skirts and you have modeled them so lovely!! My favorite was the tan one! I love the skirts! 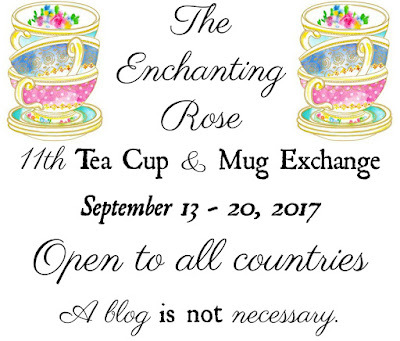 I'm looking forward to the teacup exchange! Oh, I remember the beautiful dress Sarah made you before and these skirts are no different. She did a wonderful job and they look beautiful on you. Those skirts are adorable. I love the fabric and the shape of the skirts.